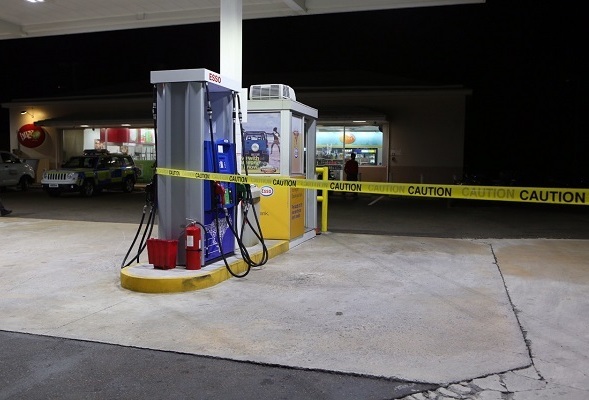 The police are appealing for witnesses to the robbery that took place last night at the Esso Tigermarket in Hamilton Parish, particularly anyone who may have “seen a male lurking” in the area of Radnor Road and North Shore Road between 7:30pm and 8pm. Last night the police said the suspect got an undisclosed amount of cash, and as he was leaving he “ran over” the female cashier, who was taken to the hospital with injuries that are not believed to be life threatening. A police spokesperson said, “The Bermuda Police Service is still appealing for witnesses to the robbery that took place yesterday evening at the Esso Tigermarket in Hamilton Parish, particularly anyone who may have seen a male lurking in the area of Radnor Road and North Shore Road in Hamilton Parish, between 7:30pm and 8pm. “Also, Police would like to speak with anyone who may have any knowledge of this incident, no matter how insignificant your information may seem to you, we would like for you to make contact with the Criminal Investigation Department 2950011 or you can call the confidential Crime Stoppers on 800-8477.
no description of the bike? or male?